WASHINGTON — Younis Shokuri, a Moroccan detainee at the Guantánamo Bay prison, said he feared being repatriated to his native country. But the Moroccan government told the United States that it would probably release him without charges 72 hours after any transfer. So last September, Mr. Shokuri went home — reluctantly, but voluntarily. But despite its assurances, Morocco has kept Mr. Shokuri in custody and is weighing criminal charges, apparently focused on allegations that he was involved with a Moroccan terrorist group before his capture in Afghanistan in late 2001. Mr. Shokuri’s lawyers have demanded that the Obama administration press Morocco to live up to what they thought was a deal. Both governments have said little to explain the discrepancy. Several officials familiar with behind-the-scenes legal and diplomatic discussions are now shedding light on the murky episode. Beyond its importance for Mr. Shokuri, his situation illustrates how difficult — and messy — it can be to winnow down the ranks of detainees viewed as posing a lower-level security risk at the Guantánamo prison, which the Obama administration still wants to close in its final year in office. Of the 91 remaining detainees, 34 are recommended for transfer, and a parole-like review group has been adding names to the list. Each man presents a problem: The government has to find a place that is willing to take him and that can be trusted to keep an eye on him without abusing him. Republicans in Congress who oppose closing the prison frequently criticize transfers, noting that some former detainees have gone on to engage in terrorist activity after their release. Human rights groups have criticized the rare instances when the United States has forcibly repatriated detainees to countries that have questionable records on human rights. The Moroccan government initiated prosecutions of all 11 Moroccan citizens repatriated from Guantánamo during George W. Bush’s presidency; four were convicted and the rest were released for insufficient evidence, a leaked cable shows. Three of the 11 reportedly went to Syria and were killed in the civil war there, fighting with an Islamist rebel group. Rights groups have accused Morocco of torturing terrorism suspects, although American officials say it has lived up to diplomatic assurances not to abuse the former Guantánamo detainees. Against that backdrop, Cori Crider, a lawyer for Mr. Shokuri with the London-based international human rights group Reprieve, said the American government appeared to have gotten rid of him in a “dishonorable” way. Ian Moss, the chief of staff in the State Department office that negotiates detainee transfers, said he could not comment on sensitive diplomatic conversations. Moroccan diplomatic and security officials did not respond to several inquiries. Mr. Shokuri, now 48, left Morocco around 1990 and went to Pakistan, according to military and court documents. He eventually came to live in Afghanistan and frequently interacted with other Moroccan expatriates. After the Sept. 11, 2001, terrorist attacks, when the United States began bombing Afghanistan, he attempted to flee but was arrested by Pakistani security forces and transferred to Guantánamo. Mr. Shokuri said he had been doing humanitarian work in Afghanistan, but the United States government suspected that he was a part of a terrorist organization focused on overthrowing the Moroccan monarchy, called the Moroccan Islamic Combatant Group, or G.I.C.M. In 2003, the group was linked to a suicide bombing attack in Casablanca. 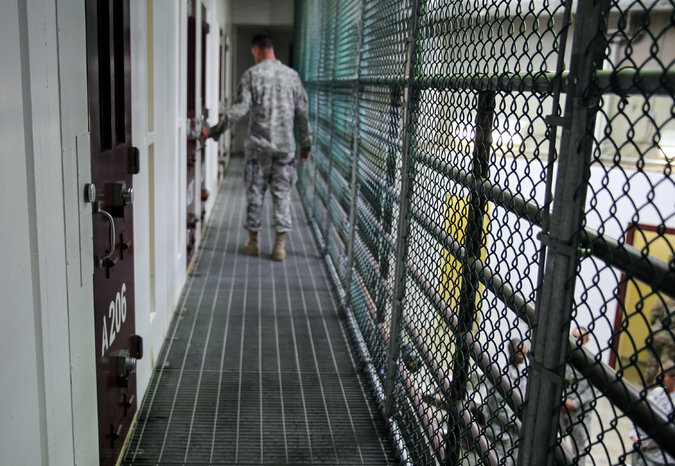 In all, 14 Moroccan men were brought to Guantánamo from the Afghan war zone. Most were repatriated by the Bush administration, but Mr. Shokuri was still there in 2009, when the Obama administration created a six-agency task force to review the remaining detainees. It recommended transferring him, too. But at the time, at least, the United States did not seem to think he was innocent. State Department cables from October 2009 that were leaked by Pvt. Chelsea Manning, formerly Bradley Manning, show that “a key factor in the approval” of putting him on the transfer list was the understanding that Morocco would prosecute him, meaning he would stay locked up after his return. Meanwhile, however, in a habeas corpus lawsuit, Mr. Shokuri’s lawyers argued that the evidence that he was part of the Moroccan terrorist group was dubious, saying it traced back to “tortured confessions” from prisoners in Moroccan custody and unreliable jailhouse informants.